30 minutes is too long. I acknowledge that. A 2 to 3 minute wait time would be ideal, and it's also originally what I had in mind. Pardon me for being "that guy", but I've never really understood what was so fun about CRP. It gets boring very fast. The game is entirely centered around the acquisition of money. Games like this ie cookie clicker constantly force your brain to release dopamine because there's no losing condition- you constantly earn money just for existing. Every time you buy a reward (education level or job) your brain thinks your making progress on the task and releases more dopamine which makes you want to unlock more rewards. Even when killing players and taking their money you get the same effect. This is basically the same stuff gambling uses which is the promise that you'll always be winning, even when you lose. Candy crush offers boosters which increase your odds of winning slightly but you can still easily fail all the levels- it's the thought that you are better than before that hooks players. If you were a good criminal, you would never have gotten caught by the police in the first place. 1.5 months and no updates? What gives? Basically right after I posted this topic I got promoted at my work to 50+ hours a week with a bunch of travelling. The little free time I've had each week that I'm not working, sleeping, or driving has been spent working on Minigolf (you should totally check it out). Luckily now my work is starting to slow down and Minigolf is finally shipping after 4 months in beta and I can finally shift my attention towards CRP2. The mod is so much closer to hosting now more than ever so it would be a complete waste if I didn't finish it the rest of the way up. Some remaining stuff I need to finish before hosting a beta server is a bunch of mundane stuff like configuration GUI's, rewriting sales events, renaming variables in the code, and adding the 80 if() statements for all of the perks for jobs. Hopefully I should be able to get all of that done and more over the next 2 months to host a beta server in December. I'm also still looking for somebody to model weapons and code weapons that have already been modeled. Monetary incentive available, message if interested. Hey op, how did you get the photos to align left of the page and place text on the left? I tried to do it but the text would only appear above or below the picture. Company owners select the minimum and maximum numbers of an item to manufacture, items with inventories below the minimum will be manufactured first. Items with inventories at or above the maximum will not be manufactured. You will want high demand items to have the larger inventories, whereas less popular items would ideally only have 1 in stock. 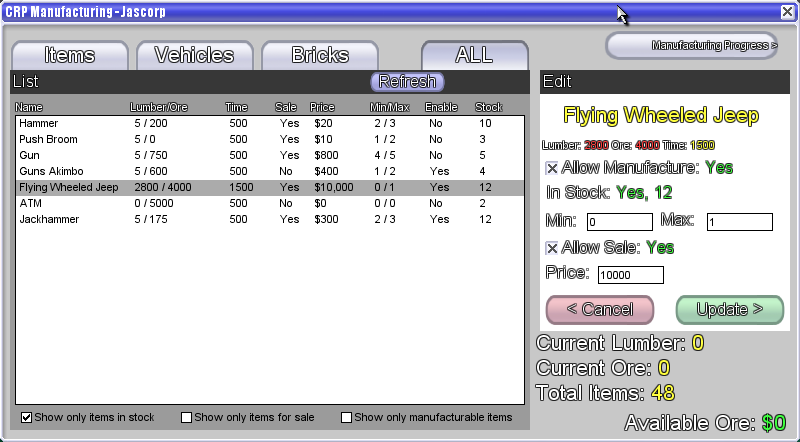 The manufacturing progress button would show the status of all of the factory bricks as well as who is currently manufacturing what item. Also made a typo where it says "available ore" instead of "available funds"
Trying to spawn a vehicle or plant a brick will automatically search for the cheapest price and company to purchase from. 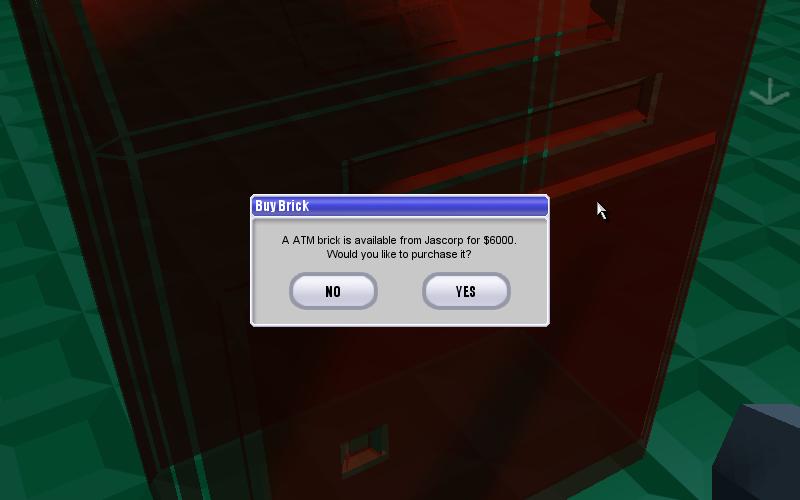 Clicking "yes" will plant the brick/spawn the vehicle and charge the player if they have the cash for it. 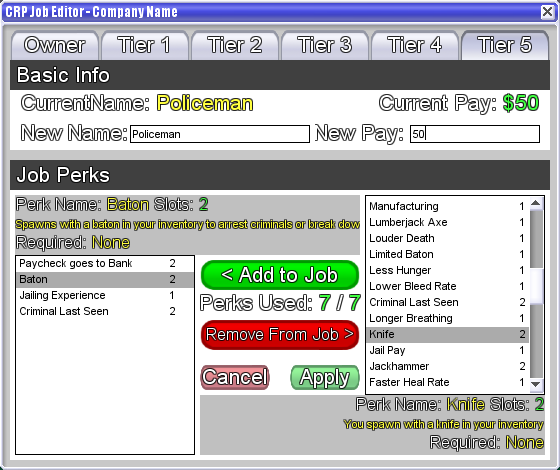 Lastly we have the job editor. Pretty self explanatory. Add or remove perks to the job and use up to 7 perk slots, possibly more in the future. Hey Jasa is that you? It's Sleven. I didn't know you were still playing, glad to see you're upholding the cityrp legacy. Went on a nostalgia trip and visited the old York thread and I hope you can forget our past differences. Best of luck with this project, I will be eager to see the finished thing. I quit playing from mid 2015 to mid 2017 but picked up the game again recently. Glad you're looking forward to it. Dang, really looking forward to this perk system! It seems really cool! This is really cool! I would love to beta test if that's available. If ever possible, I would also like to host a server with the mod. This is the kind of expansive "CityRPG" mod I've been waiting for, and apparently some people still play Blockland so I'd be interested to see what can come out of it. Nice job! Glad you're looking forward to it. I doubt it'll ever make an official release.